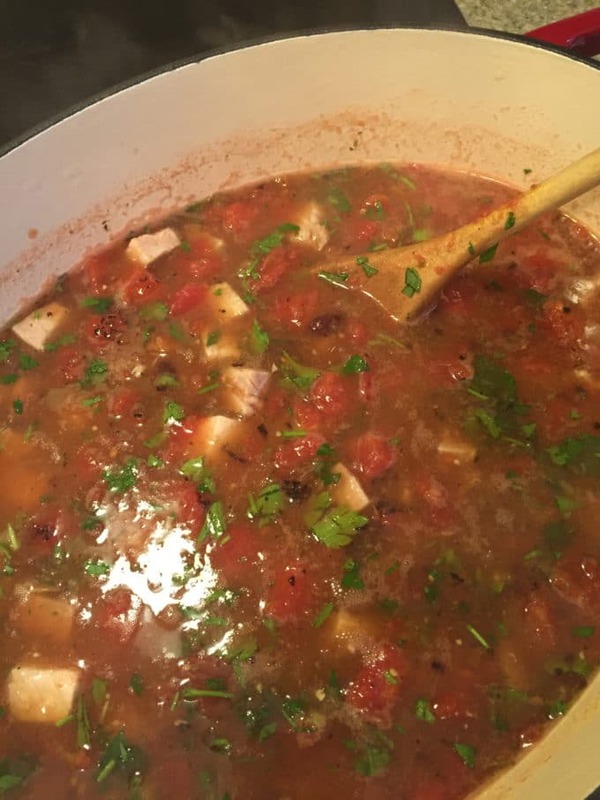 Are you looking for a quick and easy stew recipe? What about a pork stew recipe that is versatile and you can have on the table in less than 15 minutes? 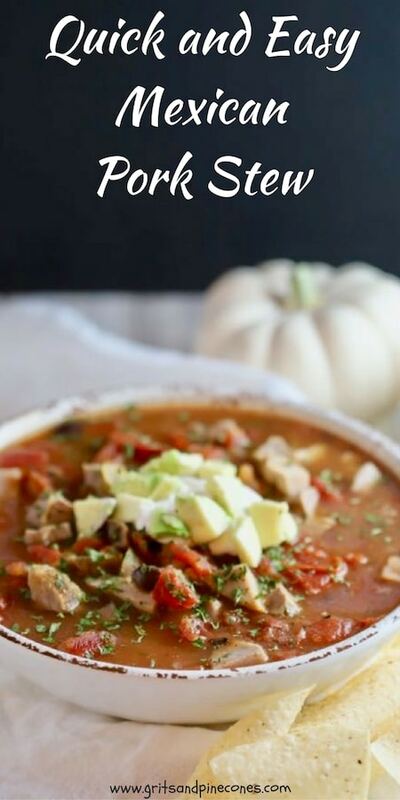 What if I told you that this Quick and Easy Mexican Pork Stew recipe is low in calories, healthy and hearty, plus full of vitamins, fiber, and minerals, and is delicious? Have I got your attention? You have to try this Quick and Easy Mexican Pork Stew recipe! It’s simply out of this world! Salsa verde and cumin give it a southwestern kick, and fire-roasted tomatoes give it a wonderful depth of flavor. Best of all, you just dump everything in a pot and heat it up. So, it’s perfect for days when you don’t have the time or inclination to make a big meal. It’s also really easy to change-up to accommodate your family’s taste. Substitute chicken for pork, and you have another winner. Want a meatless meal? Simply leave the pork out and use vegetable broth. However, you decide to prepare it – it’s delicious! I served Quick and Easy Mexican Pork Stew to friends for lunch a month ago, and they gave it rave reviews and asked for the recipe. In fact, when I ran into them the other day, they told me they liked it so much, they have made it several times since they had it at our house. That’s high praise! 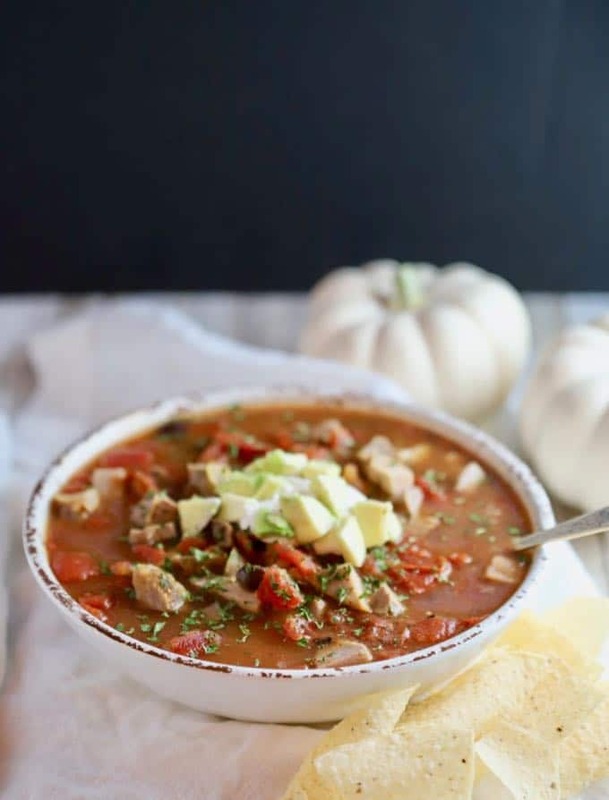 Whether you are having friends over for a hearty meal, or just feel like hunkering down at home on a cold rainy day, this Quick and Easy Mexican Pork Stew is perfect! It’s so easy you can almost make it in your sleep. Pick up shredded pork from your favorite barbecue place, or a deli roasted chicken, on your way home from work, and you can have a hearty and nutritious meal your family will love on the table in less than 15 minutes. 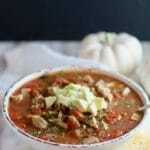 Intrigued, click on this link for even more delicious soup recipes. 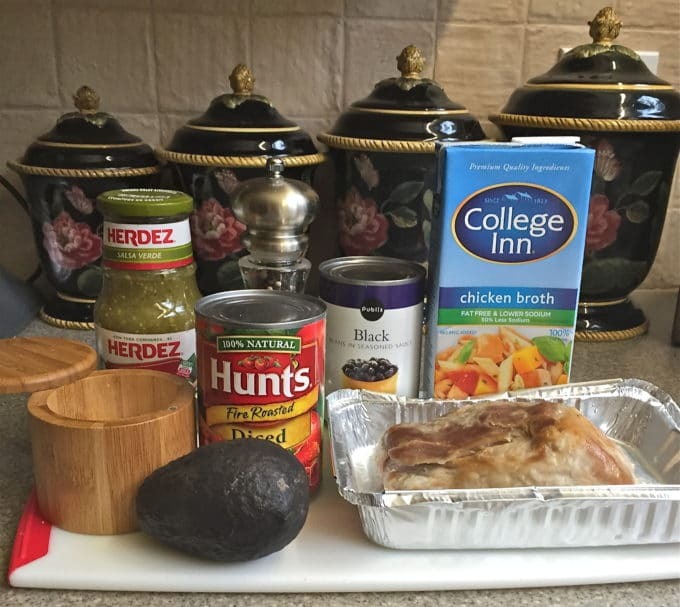 The ingredients are simple: a jar of salsa verde, reduced sodium chicken broth, a can of black beans, two cans of fire-roasted diced tomatoes, a pound of shredded roasted pork (or cooked chicken), ground cumin and kosher salt and pepper. Optional toppings include sour cream, sliced or cubed avocado, and tortilla chips. To make, simply add the salsa verde, chicken broth, black beans, fire-roasted diced tomatoes with juice, your pork or chicken, and ground cumin to a large saucepan or Dutch oven over medium-high heat. Bring to a boil, then reduce the heat to medium and simmer for 10 minutes. Stir occasionally. When it’s done, taste and add kosher salt and ground black pepper, if needed. Serve immediately. Optional: top with a dollop of sour cream, sliced or cubed avocado, and crushed tortilla chips if desired. You have to try Quick and Easy Mexican Pork Stew! It only takes 15 minutes to make and salsa verde and fire-roasted tomatoes give it a southwestern flavor. 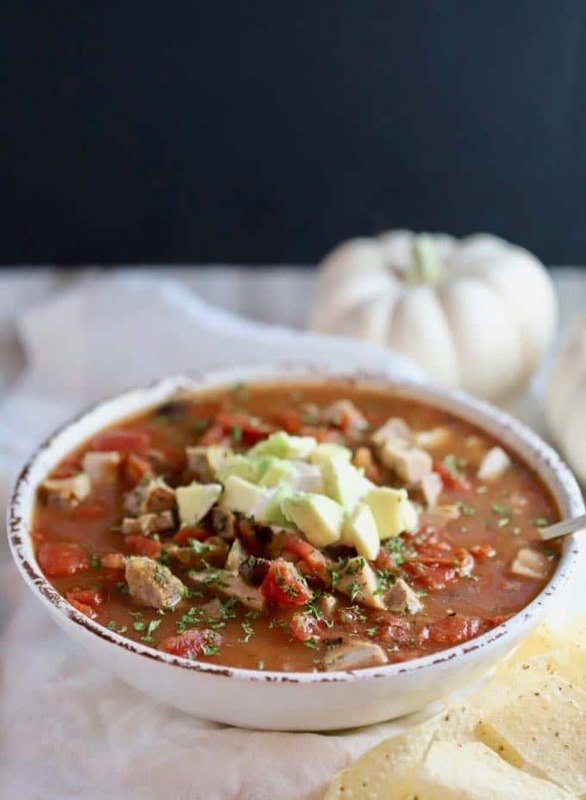 To make, simply add the salsa verde, chicken broth, black beans, fire-roasted diced tomatoes with juice, low-sodium chicken broth, your pork or chicken, and ground cumin to a large saucepan or dutch oven over medium-high heat. Bring to a boil, then reduce the heat to medium and simmer for 10 minutes. Stir occasionally. When it’s done, add chopped parsley, taste and add kosher salt and ground black pepper if needed. To serve, garnish with a dollop of sour cream and avocado chunks or slices, and serve with tortilla chips. Optional, squeeze a little fresh lime juice on before serving.